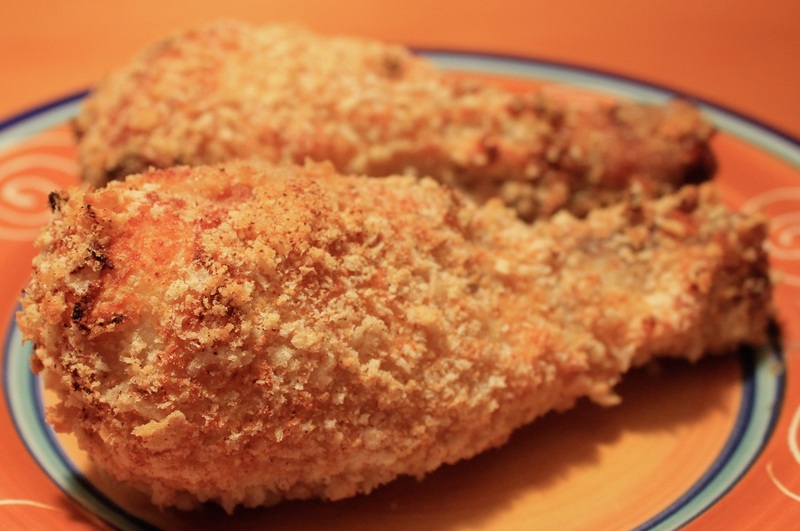 These chicken legs have a nice crispy, crunchy coating without being fried in oil. They are moist with just a hint of spicy red pepper. Pre-heat oven to 425 degrees. Line a baking sheet with foil, place a wire rack on top of the foil, and coat the rack with cooking spray. In a small bowl mix the breadcrumbs, Parmesan cheese, ground red pepper, paprika, garlic powder, onion powder, and dried mustard. Place the flour in another small bowl. Finally, in a third small bowl place the yogurt. Remove the chicken from the refrigerator and drain well. Lightly flour each chicken leg, then apply a thin coat of yogurt, finally coat each leg with the breadcrumb mixture. Place each leg on the coated wire rack. Bake the chicken legs for 25-30 minutes, or until juices run clear and chicken is cooked through.